A suicide car bomb in central Turkey has killed 13 soldiers aboard a bus and wounded 56 more, officials say. 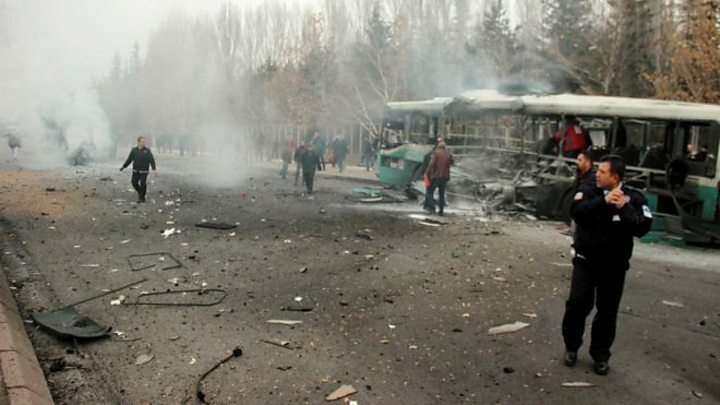 The blast destroyed the bus carrying soldiers visiting a local market in the city of Kayseri. An army spokesman said civilians may also have been injured. It comes a week after 44 people were killed in a PKK attack in Istanbul. Regional governor Suleyman Kamci said the blast in Kayseri, a usually calm industrial hub in Central Anatolia, was carried out by a suicide bomber parked next to the bus near the entrance to Erciyes University. The soldiers were said to be on leave from a nearby military base. Turkish Deputy Prime Minister Numan Kurtulmus said the materials used were similar to those used in Istanbul. "All indications at present point to the PKK," he said. President Tayyip Erdogan said that Kurdish militants were attempting to "trip up Turkey, cut its strength and have it focus its energy and forces elsewhere". Turkey has suffered a series of fatal bombings in 2016 at the hands of both the Kurdish militants and jihadists. It is now a depressingly familiar cycle for this country: A bombing, followed by promises from the government to eradicate terror and then reprisal attacks against the PKK. And yet the attacks keep coming - and Turkey keeps grieving. The condemnation after the violence seems frustratingly empty. How can Turkey break the wave of attacks? Security has been massively increased across Turkish cities - armed police roam the streets and new metal detectors have been put in place. But in a country of 80 million people, which borders Iraq and Syria and which has faced a decades-long Kurdish insurgency, only better intelligence can really stem this tide. Turkey's intelligence agency is powerful - and reinforced by its counterparts like the American FBI and the British MI6, which have representatives here. But there are clearly holes that are allowing attackers to slip through the net. And Turkey is paying a heavy price for the failings. Later on Saturday, a crowd stormed the Kayseri offices of the pro-Kurdish Peoples' Democratic Party (HDP), parliament's second-largest opposition party. The HDP condemned the bombing in the city and called for an end to "the politics, tone and language that creates tension, polarization, hostility, chaos and conflict". An instruction from the prime minister's office urged the media to refrain from publishing anything that may cause "fear in the public, panic and disorder and which may serve the aims of terrorist organizations", the Associated Press reported.